Islamic architecture is in part comprised of those buildings and built environments intended for use in Islamic worship, commemoration, and instruction. Among the architecture of this group are mosques, madrasas or schools, mausoleums, and shrines. Islamic architecture may also be considered as the creation of patrons and builders who profess Islam or those that live in a region ruled by Muslims. These buildings can generally be described as secular, and include suqs (marketplaces), hammams (public baths), khans (inns), caravanseries or roadside inns, palaces, and houses. Although Islamic architecture is infinitely varied in plan, elevation, building material, and decorative programs, there are several recurring forms found in all types of buildings, be they religious, secular, public, or private. These basic components are the dome, the arch, and the vault (Fig. 1 a-c). Before describing the different aspects of Islamic architecture it is important to pause and ask if such a categorization is viable. This question stems from three considerations. First is the fact that the forms and decorative practices of these buildings are largely adaptations of pre-Islamic models. Thus it is not improper to ask if Islamic architecture should in fact be labeled Classical, Sassanian, or Hindu. If all that was being considered were forms emptied of meaning and function then the answer to this question would be a resounding yes. 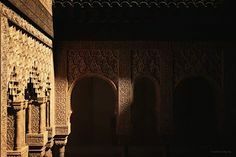 The second consideration derives from the fact that many of the architectural forms considered as Islamic architecture were built for secular purposes. How, then, can a religious category designate houses, inns, baths, or even cities? Are there essential qualities of these secular spaces that give them meaning as Islamic architecture? Finally, there is a question of fit. If Christians, Jews, and Hindus living within an Islamic region build similar forms then would not the designation be too narrow? And, conversely is the designation too broad? For how can a Malaysian congregational mosque built in the twenty-first century be placed under the same analytic category as an Umayyad congregational mosque of the eighth century, when they are not built of the same materials and do not display common decorative practices or forms? While such considerations are beyond the scope of this article, it is important to realize that contemporary historians of Islamic architectural history weigh these questions critically. Some have responded by introducing more specified categories of Islamic architecture, such as those based on regional, dynastic, and chronological designations. Others have introduced new analytic models, for example, by studying the development of certain architectural forms, such as the minaret, or a practice, such as the use of public inscriptions. Taken together, recent scholarship of Islamic architecture presents a more historically contingent and culturally varied approach to the study of Islamic architecture. Many of the problems associated with the category of Islamic architecture arise from what is taken as the meaning of architecture. If Islamic architecture is simply a material entity, composed of classical forms, then the notion of Islamic architecture as being distinct from Byzantine or Sassanian becomes questionable. 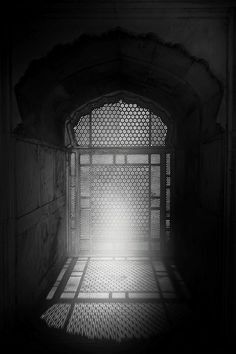 However, if by architecture we mean a dynamic space that produces relationships between people and helps individuals understand and articulate their identity through their engagement (or disengagement) with that space then the meaningfulness of Islamic architecture can be seen as a distinct construction. The mosque is the preeminent dynamic space that stands at the center of Islamic society and culture. It is both a spiritual site of worship and a social site of education, debate, and discussion of religion, politics, and current events. Arab caliphs and their governors were the first builders of architectural mosques. Emerging from a Bedouin culture that did not necessitate permanent architecture, these early Islamic rulers adopted and adapted the building traditions of the cultures they conquered to guide the formation and style of the new mosques. Two notable sources that contributed to the early mosques’s forms and styles were the Byzantine and Sassanian Empires. In the conquered regions previously dominated by these cultures Arabs established garrison cities and ordered the founded mosques to provide the Islamic community with a space to meet and pray. The mosques that appeared in the first centuries of Islamic history were either renovated structures, for example, Christian churches converted into mosques, or they were new buildings constructed from recycled parts of abandoned buildings, particularly columns of Roman ruins. Some Islamic rulers, such as the Umayyad builders of the Dome of the Rock (completed in 692 c.e.) and the Great Mosque of Damascus (706-714 c.e. ), employed Byzantine artisans practiced in mosaic design to decorate their structures with dazzling images of vegetation, jewelry, and Qur’anic inscriptions. Over time, the practice of employing local building techniques, decorative practices, and architectural forms resulted in mosques of different regions and periods of the Islamic world appearing visually dissimilar. They are, however, all connected by their principal function: to provide a central space for the Islamic community to unite, pray, and exchange information. The Prophet Muhammad’s house was the first constructed mosque (Fig. 2). Established soon after his community moved to Medina in 622 c.e., it was a simple, unremarkable enclosure. The principal consideration of Prophet Muhammad’s mosque was to provide a large, open, and expandable courtyard so the ever-growing community could meet in one place. The walls of the courtyard were made of mud-brick and had three openings. The walls surrounded an open space of about 61 square yards (56 meters). On the east side of the courtyard were the modest living quarters of Prophet Muhammad and his family. Palm tree trunks were used for the columns and palm leaves for the roof of a covered area called the zulla, which was built to protect worshipers from the midday sun. The zulla marked the direction Muslim prayer was originally oriented— north, toward the holy and venerated city of the Jews, Jerusalem. Later, Prophet Muhammad, while in prayer, received divine enlightenment that caused him to change the direction of prayer south to the Ka’ba in Mecca. The zulla was therefore moved to concur with the new qibla (direction of prayer). Besides the qibla, another architectural form introduced at the first mosque was the minbar (stepped platform or pulpit) from which Prophet Muhammad addressed the growing Islamic community. Figure 2: House of the Prophet Muhammad in Medina. The Prophet’s mosque, with its austere plan, large square enclosure, orientation toward the qibla, and minbar, provides the basic elements of subsequent mosque architecture. The first mosque type to emerge was the hypostyle plan (Fig. 3). Its basic unit, the bay (a covered area defined by four columns), could be expanded upon so the mosque could grow with the community. The hypostyle mosque typically has an inner courtyard, called the sahn, surrounded by colonnades or arcades (riwaqs) on three sides. Within the courtyard there is usually an ablutions fountain, where the wudu’ (minor ablution) is performed before the salat (prayer). There are three entrances into the sahn. The principal entrance can be a monumental portal as built in Cairo in the Fatimid Mosque of al-Hakim (1002 c.e.). Passing through the sahn, the worshiper walked into a covered sanctuary area or haram. The haram of the Great Mosque of Cordoba (786, 962-966 c.e.) is one of the most visually breathtaking. The arches of the double-arch arcades are composed of alternating red brick courses and pale stone voussoirs that when viewed from within the sanctuary produce a visually captivating labyrinthine configuration over one’s head. Once inside the sanctuary of a mosque the focus is the qibla, a directional wall that indicated which way to pray. In the center of the wall was often a semicircular niche with an arched top, known as the mihrab. In large mosques a minbar located to the right of the mihrab was also included. It was from atop the minbar that on Fridays the khutba (sermon) was delivered by the imam or prayer-leader. The minbar is based on the stepped platform that was used by Prophet Muhammad. It ranges from a simple three-step elevation to a highly decorated monumental stairway of many steps. The very top of the minbar is never occupied as it is symbolically reserved as the space of Prophet Muhammad, the original imam. In large mosques another platform called the dikka is provided at the rear of the sanctuary, or in the courtyard, and along the same axis as the mihrab. A qadi repeats the sermon and prayer from the dikka for those standing too far from the minbar. Located outside of some mosques is a minaret that, along with the dome, has become the architectural symbol of Islam due to its ubiquitous presence and high visibility. Constructed as a tower, it either stands outside the mosque precinct or it is attached to the outer walls or portals of the mosque. The minaret varies in shape, ornamentation, and number depending on the region and building conventions of the patron. Besides visually broadcasting the presence of the mosque and Islam within a city or landscape the minaret also serves as an effective place for the mu’adhdhin or “caller” (also muezzin) to perform the adhan (call to prayer) and be heard for a great distance. The maqsurah is a later addition made to the hypostyle-plan mosque. It is a differentiated, protective space, adjacent to the qibla wall. The maqsurah is found in mosques where the imam or ruler wanted either to be protected or ceremonially separated from the congregation. It was originally built as a raised platform separated with a wooden screen that allowed total to partial concealment of its occupants. Types of Mosques. There are two general types of mosques. The first is the congregational mosque, known as the jami masjid. The jam¥ (from the Arabic word for “to gather”) is built on a large scale to accommodate the entire Islamic community of a town or city. The second type is known simply as masjid (from the Arabic word meaning “to prostrate oneself”). Masjids are small community mosques used daily by members of a quarter, or an ethnic group within a city. Masjids were also constructed as subsidiary structures next to mausoleums, palaces, caravanseries, and madrasas. Early masjids and jam¥ masjids, while different in size, shared the same architectural forms and style. However, as Islamic rulers grew in wealth and power starting in the late seventh century, they built monumental jam¥ masjids in their cities to reflect the preeminence of Islam and the permanence of their dynasty. Adapting the basic building elements of vaults, arches, and domes, these rulers built mosques that from the exterior appeared to span large areas and soar to great heights. To create a stunning visual experience in the interior the jami masjids were ornamented with complex geometric and arabesque or vegetal decoration in mosaic and stucco. Quartered marble decorated the lower walls, or dados, and Qur’anic and historical inscriptions in stucco and mosaic Arabic script engaged the intellect. Regional Variation of Mosques. Although there is no one style to unify the mosques of the Islamic world, they can be divided into broad regional variants. The mosque style of central Arabia was an early development influenced by church- building of the Syrian Byzantine Empire and palace-building of the Sassanian Persian Empire. In the east, the ground plans of the Great Mosques of Kufa (638 c.e.) and Basra (635 c.e.) were square like those of Zoroastrian temples. When the Great Mosque of Kufa was rebuilt in 670, its haram was based on the apadanas or throne rooms of Achaemenian kings: five rows of tall stone columns supporting a teak ceiling. Similarly, the Great Mosque of Damascus, built by the Umayyad caliph al-Walid between 706-714, was based on indigenous building conventions. Architects used the preexisting enclosure of the temenos and church, but since the mosque had to be oriented to the south, the qibla wall was on the longer side of the rectangular space. Also, due to the constraints of the preexisting quadrangle, the courtyard was transversal in orientation rather than longitudinal. The haram contained a short, wide central nave with a gabled roof and a wooden dome in its center. Three aisles of double-tiered arches, parallel to the qibla wall, supported a gabled ceiling. Al- Walid, wanting to outdo the neighboring churches and temples, employed Syrian-Christian artisans to richly decorate the interior of the mosque with imported gold and colored mosaics and marble, and even used rock crystal for the mihrab. The early Abbasid caliphate, ruling from Baghdad from 749 to 847, first built their mosques with square floor plans as the early Umayyads had done in the region. However, after the Abbasids moved their capital to Samarra, their mosques reflected the rectangular hypostyle form favored by the later Umayyads. The Great Mosque of Samarra, built by al- Mutawakkil from 848 to 852, was the largest hypostyle mosque of its time with nine rows of columns in the sanctuary that supported a thirty-five-foot-high ceiling. The mosque is most famous for Malwiyya, the colossal spiral minaret. Once faced with gold tiles, Malwiyya’s great size and unusual shape made the Great Mosque of Samarra a highly visible presence in the surrounding landscape. Sub-Saharan West African mosques are unique in their use of organic materials that are constantly replenished over time, such as tamped earth, timber, and vegetation. Due to seasonal deterioration during the wet and dry seasons, the mosques are constantly being repaired and resurfaced. The predominant quality of these structures is their rounded organic form, reinforced with projecting timber beams or torons, which also serve as supports for scaffolding when the mosque is being resurfaced. The Great Mosque of Djenne (thirteenth century) is the most representative of the West African mosques. Its tall rounded towers and engaged columns, which act as buttresses, easily flow into each other and give the structure its characteristic verticality and overwhelming majesty. The central-planned, domed mosque of the Ottomans is yet another distinctive type. When the Ottomans conquered Constantinople in the fifteenth century they converted the Byzantine church of Hagia Sophia into a mosque by framing it with two pointed minarets. Later in the nineteenth century they added roundels inscribed with calligraphic writing of the names of Muhammad, Allah, and the early caliphs. Using the Hagia Sophia as their prototype, Ottoman rulers built mosques in the principal cities of their empire. The mosques were defined by large spherical domes, with smaller half-domes at the corners of the square, and four distinctively shaped minarets—tall, fluted, and needle-nosed—that were typically placed at the exterior corners of the mosque complex. The Selimiye Cami (Mosque of Selim) in Edirne, Turkey (1507-1574), best characterizes the central-plan Ottoman mosque. Moving further east to Seljuk Iran, another type of mosque emerges known as the four-iwan mosque. The iwan is an open vaulted space with a rectangular portal orpishtaq. In a Seljuk mosque four of these iwans would be oriented around a central courtyard. The Great Mosque of Isfahan, built in this style in the twelfth century, is a monumental four-iwan mosque. Of these, the principal or qibla iwan is the largest, with a large domed maqsura and muqarnas vaulting. To lend it further visual impact, two minarets were added at the corners of the portal. The iwan that stood opposite the qibla iwan followed in size, and it was both smaller and shallower. The lateral iwans were the smallest. While the exterior of the mosque was unadorned, the inward-facing iwans were decorated with architectural ceramic tiles of turquoise, cobalt blue, white, deep yellow, and green. The decorative designs contained geometric and arabesque patterns as well as Kufic inscriptions. The layout of the Great Mosque of Isfahan influenced countless other mosques in Iran, Central Asia, and South Asia. From their start, the mosques of South Asia were syncretic structures. They were the by-products of hired Hindu masons, indigenous architectural material taken from destroyed or decaying Hindu buildings, and necessary elements of mosque architecture such as the mihrab. The mosques were trabeated at first and decorated with popular Hindu motifs such as vegetal scrolls and lotuses. The plans of South Asian mosques ranged from traditional hypostyle, to Persian four- iwan types, and to single-aisle domed plans. The earliest mosques of the Delhi sultanate (1192-1451) were hypostyle and built out of reused materials from Hindu and Jain temples such as the Quwwat al-Islam in Delhi of the late twelfth century. The greatest achievement of this mosque is the monumental minaret, the Qutb Minar. Standing at 238 feet it was a victory tower that announced the power of the new religion to the surrounding landscape. The next significant mosque type of South Asia is the single-aisle plan with five bays that used stucco and colored stones as surface decoration and squinch and muqarnas vaulting. These mosques had monumental central portals and domes. The Bara Gumbad mosque in Delhi, built by Sultan Sikandar Lodi in 1494, and the QaPa-e-Kuhna mosque of Sher Shah (1540-1545) exemplify this style. It was this basic form of mosque architecture that was later adopted by the great Mogul dynasty (1426-1848). Two exemplary Mogul- style mosques are Akbar’s Great Mosque of Fatehpur Sikri (1571-1572) and Shah Jahan’s Great Mosque at Delhi (1650-1656). These mosques have large courtyards and are built from the local red sandstone combined with white marble to create decorative geometric and vegetal patterns. The distinctive feature of Akbar’s mosque at Fatehpur Sikri is the monumental portal on the south side called the Buland Darwaza. Its form is that of a colossal pishtaq (tall central portal), derived from Timurid origins. It is embellished with native Indian architectural elements as well such as small open pavilions called chatris and lotus-shaped medallions. Located on the west side of the great courtyard is the sanctuary, a three-domed prayer-hall with a central pishtaq. The Great Mosque of Delhi was based on the four-iwan plan. Three onion-shaped bulbous marble domes surmount the qibla iwan, the same shape used for the dome of the Taj Mahal. The minarets are divided into four parts and are capped with small pavilions. Smaller, private mosques built for the Mughal palaces of Lahore, Agra, and in Delhi reflect the fine marble carving skills of the Indian artisans. Faced with white marble, elegantly carved with vegetal patterns, these mosques were then topped with graceful onion-shaped domes with lotus molding and metallic finials. These private imperial mosques were the architectural counterparts of the elegant gems so highly prized by the Mughals. One of the secular types of Islamic architecture is the palace, which matches the mosque in reflecting the rich variety of forms, ornamentation, and the sophisticated skills of artisans. Built as large complexes rather than singular units, Islamic palaces were generally self-sustaining, and most contained bastion walls, towers, gates, baths, stables, private quarters, public meeting spaces, workshops, offices, hospitals, harams or zenanas (reserved for the women of the palace), libraries, pavilions, fountains, and gardens. These palaces were built as the architectural embodiment of the ruler, the spatial metaphor of his dominion, and, if built in idyllic settings with surrounding gardens, were considered earthly paradises. The first palaces were built by the Umayyads and were modeled after Roman villas. Serving as hunting lodges or rural residences these include the Qasr al-Hayr, Khirbat al-Mafjar, and Khirbat al-Minya of the eighth century. Other well- known palaces are the Fatimid Palace of al-Qahira (1087-1092), Umayyad Madinat al-Zahira of Cordoba (936-976), the Nasrid Alhambra in Granada, Spain (early fourteenth century), the Ottoman Topkapi complex, and Mogul Fatehpur Sikri and Red Fort, built in Delhi during the sixteenth century. Islamic secular architecture is also public in nature. Among these buildings are the caravanseries and hammams. The caravanserai was a stopping place for travelers to rest and water and feed their animals. A typical caravanserai had a large open courtyard with a single large portal. Inside, along the walls, were covered arcades that contained identical stalls to accommodate a traveler, and his servants. Animals were usually kept in the courtyard or stables located in the corners. Caravansaries were usually fortified with bastions and turreted walls. As with mosques and palaces, caravansaries vary in ornamentation and form from region to region. Inside the city the khan housed the travelers and merchants. These structures were multistoried and overlooked a central courtyard. The animals and goods were kept on the ground floor and apartments were located above. The public bath or hammam was another architectural form found in many Islamic cities. Along with the khan it was located in the suq or marketplace. Adopted from the Romans, the hammam was used for washing and purification before Friday prayer. It was composed of large rooms for steam baths as well as others for soaking in hot and cold water, all of which communicated through waiting halls. Utilizing marble covered floors and walls, arches, large ornamented domes that helped circulate hot air, muqarnas vaults, and stucco decoration, some public baths were highly luxurious environments. Men and women bathed separately either in their own hammam, if there were two in a town, or on different days or at designated times. The final type of Islamic architecture to be considered is the domestic. The typical house built in Islamic societies is oriented inward. A bent entrance that turns at a sharp angle marks the transition from the outside world to the home. The entrances of homes do not usually align with those across the street, so the privacy of the interior is maintained. On the inside the rooms are arranged around a central courtyard and range from the private spaces of the family to semiprivate spaces where male guests, who were not members of the family, could enter. The open courtyard ventilates the house. A central basin or fountain, part of most courtyards, also provides a cooling effect and the soothing sound of falling water. In more prosperous households delicately carved wooden screens called mashraabiyyat were used to create private space, filter air from the outside, and allow light to enter the home. 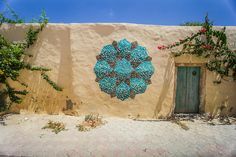 The exterior of an Islamic house is often left unadorned. Only upon entering the home will the visitor know the class status of the owner. Abu-Lughod, Janet. “The Islamic City: Historical Myth, Islamic Essence, and Contemporary Relevance.” International Journal of Middle Eastern Studies 19 (1987): 155-176. Blair, Sheila S., and Bloom, Jonathan M. “The Mirage of Islamic Art: Reflections on the Study of an Unwieldy Field.” Art Bulletin 85 (2003): 152-184. Bloom, Jonathan. Minaret: Symbol of Islam. Oxford, U.K.: Oxford University Press, 1989. Creswell, K. A. C. A Short Account of Early Muslim Architecture. 2d ed. Aldershot, U.K.: Scholar Press, 1989. Frishman, Martin, and Hasan-Uddin, Khan, eds. The Mosque: History, Architectural Development & Regional Diversity. London: Thames and Hudson, 1994. Grabar, Oleg. The Formation of Islamic Art. New Haven, Conn.: Yale University Press, 1987. Hillenbrand, Robert. Islamic Architecture: Form, Function and Meaning. New York: Columbia University Press, 1999. Hoag, John D. Islamic Architecture. New York: Abrams, 1977. Santhi Kavuri-Bauer is an Associate Professor in the Art Department of San Francisco State University. She received her PhD in Art from University of California, Los Angeles. Her scholarly research focuses on the preservation and representation of South Asian architectural monuments, and the implications of these activities on the construction of social identities, national memory, and political protest. More broadly, her research focuses on issues of artistic agency, the intersection of modernist aesthetics in the colonial and postcolonial world, and the visual culture of contemporary Asia. Her experience in research, teaching, and museum work strengthens my commitment to innovative instruction and scholarly investigation in the fields of South Asian visual culture, colonial and postcolonial cultural theory, Contemporary Asian Art, Asian American Art, and Islamic art and architecture. Her current research deals with the modern spatial history of Mughal monuments. She argues that these Mughal sites, built between the 16th and 17th centuries, have repeatedly been produced as social spaces in which Indian nationhood was enacted, or its very possibility contested at different junctures in modern Indian history. The Mughal monument provides a unique case study of built environments as social spaces impacting the construction and contestation of modern Indian national identity. Moreover, her examination argues for a more critical and interdisciplinary approach to the study of India’s architectural monuments as local, national, and global spaces of social ordering and identity formation. Her book Monumental Matters: The Power, Subjectivity, and Space of India's Mughal Architecture appeared in 2011 with Duke University Press.